The SAG Awards are to Awards Season what the 7th inning stretch is to baseball. We are close to the end and, well, people really do relax a bit before the grand finale. They are more personal when they talk about their craft. When it comes to the jewelry, I have said it before, it usually provides some of the most-creative fine jewelry moments on the season. 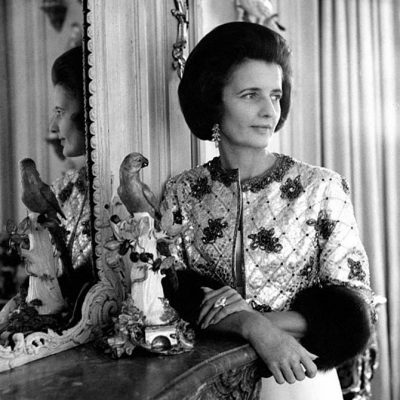 There is also always a lot of great glamour. See the best jewels of the night below. Amy Adams wore Cartier High Jewelry diamond, spinel, onyx and platinum earrings with a Celine gown. Detail of Amy Adams’s Cartier High Jewelry diamond and platinum bracelet. Laura Harrier wore Bulgari High Jewelry earrings with 2 octagonal sapphires weighing a total of 25.58-carats, 6 baguette cut emeralds and 2 emerald-cut and 2 oval shape diamonds. 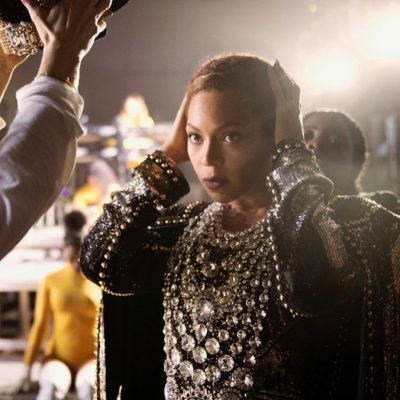 Lady Gaga wore a Dior Haute Couture dress and debuted a diamond, platinum and gold choker with heart and star motifs and butterfly wing gold and diamond earrings from the 2019 Tiffany Blue Book collection and several Tiffany T bracelets. Rachel Brosnahan wore one-of-a-kind Irene Neuwirth diamond and South Sea pearl ribbon earrings and a Dior dress. Emily Blunt wore several Forevermark jewels including Flower Drop Diamond Earrings, bangles and the Force of Nature Diamond Ring set with a 3.48-carat round brilliant. The center stone is Forevermark’s two-millionth inscribed diamond. The ring was designed by Louise Kriek the runner up of De Beers Shining Light Awards. Rachel Weisz wore Panthère de Cartier emeralds, onyx and diamond earrings. Gemma Chan wore Harry Winston vintage chandelier earrings made in 1972. The jewels feature 29.59-carats of diamonds set in platinum. Lupita Nyong’o debuted Messika’s Flint diamond earrings from the French label’s High Jewelry collection. 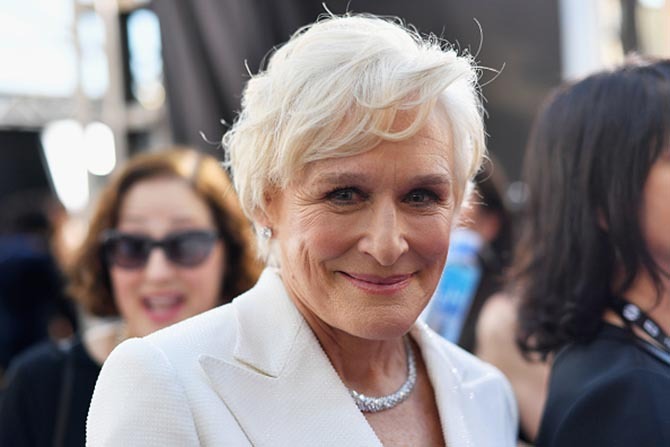 Glenn Close wore a Reflection de Cartier diamond necklace and Cartier High Jewelry diamond and platinum earrings. She also had on her grandmother’s engagement ring. She explained in a red carpet interview on TNT, that her grandmother wanted to become an actress but never could. 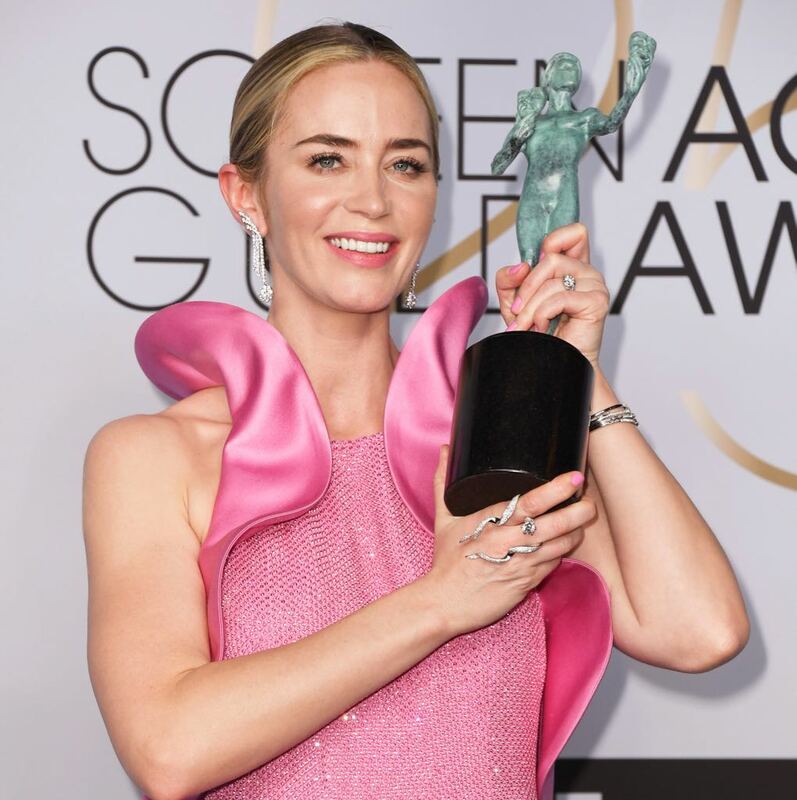 To Close the jewel meant her grandmother was with her at the SAG Awards and it reflected the theme of her film The Wife of women who deferred their dreams. Emma Stone wore Louis Vuitton earrings with a Louis Vuitton ensemble. Margo Robbie wore Chanel earrings and a Chanel dress. Mandy Moore wore Niwaka diamond earrings. Julie Garner wore Harry Winston Lotus Cluster diamond and platinum earrings. Constance Wu wore Harry Winston Lily Cluster diamond earrings and rings. She sported HW Logo Bangle bracelets as armbands. Danai Gurira in Bulgari High Jewelry diamond and platinum earrings. 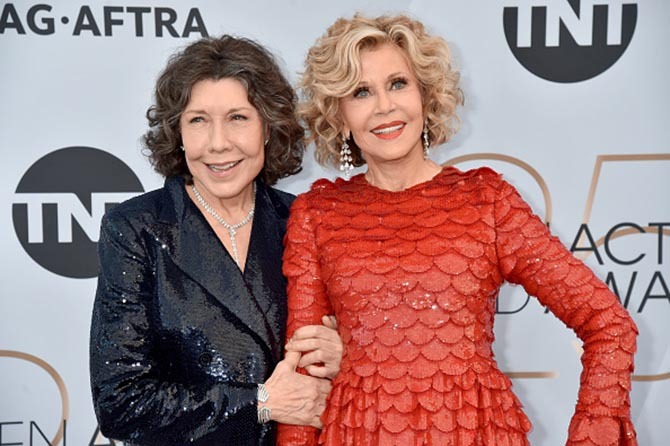 Lily Tomlin wearing diamond jewelry from Neil Lane poses with Jane Fonda who is wearing a Valentino gown and Gismondi 40-carat diamond chandelier earrings. Detail of Jane Fonda’s hand and the 20-carat pear shape D color diamond ring by Gismondi she wore.